In the past an individual’s identity was more predictable than it is today. Life’s big questions were basically settled before you were born: where you’d live, what you’d do, the type of person you’d marry, your basic beliefs, and so on. Today personal identity is a do-it-yourself project. Constructing a stable and satisfying sense of self is hard amidst relationship breakdowns, the pace of modern life, the rise of social media, multiple careers, social mobility, and so on. Ours is a day of identity angst. Known by God is built on the observation that humans are inherently social beings; we know who we are in relation to others and by being known by them. If one of the universal desires of the self is to be known by others, being known by God as his children meets our deepest and lifelong need for recognition and gives us a secure identity. 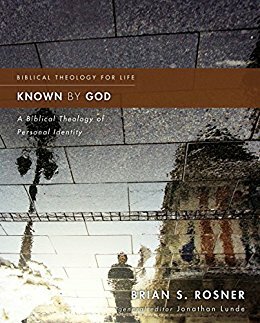 Rosner argues that rather than knowing ourselves, being known by God is the key to personal identity. He explores three biblical angles on the question of personal identity: being made in the image of God, being known by God and being in Christ. The notion of sonship is at the center – God gives us our identity as a parent who knows his child. Being known by him as his child gives our fleeting lives significance, provokes in us needed humility, supplies cheering comfort when things go wrong, and offers clear moral direction for living.